A young American woman, Alexandra Boyd, has traveled to Sofia, Bulgaria, hoping that life abroad will salve the wounds left by the loss of her beloved brother. Soon after arriving in this e From the #1 bestselling author of The Historian comes an engrossing novel that spans the past and the present and unearths the dark secrets of Bulgaria, a beautiful and haunted country. To ask other readers questions about The Shadow Land, please sign up. Hi. So the Historian was a 5 for me and The Swan Thieves a 1. Where does this lie? How good is this as compared to The Historian? It is one of my favorite books and God I cannot be let down by Kostova again!!!! Sloane For me, The Shadow Land (3 stars) is a slight improvement from The Swan Thieves (does it even deserve a star? ), but does not come close to The…moreFor me, The Shadow Land (3 stars) is a slight improvement from The Swan Thieves (does it even deserve a star? ), but does not come close to The Historian (5 stars). Does the dog die? Love her 2 previous books and want to read this--but I will not if that dog dies--just can't do it. "A land that looked nearly untouched by history, a Grimms' fairy tale setting in Alexandra's eyes." And here's where your own eyes come into favor with an Elizabeth Kostova novel. Bring with you an openness that views life, not only in the here and now, but in times past. Our modern vision tends to view most things from a slanted perspective. As if such atrocities never existed. As if humanity did not drink from the cup of indifference. As if Bulgaria and its people did not live, at a time, in th "A land that looked nearly untouched by history, a Grimms' fairy tale setting in Alexandra's eyes." And here's where your own eyes come into favor with an Elizabeth Kostova novel. Bring with you an openness that views life, not only in the here and now, but in times past. Our modern vision tends to view most things from a slanted perspective. As if such atrocities never existed. As if humanity did not drink from the cup of indifference. As if Bulgaria and its people did not live, at a time, in the dark shadows where breathing was a luxury. Alexandra Boyd arrives in Sofia, Bulgaria seeking the solace of being on different footing than her existence in America. She had lost her brother, Jack, in a hiking accident for which she encases herself in the heaviness of guilt. An English teaching position will keep her more than occupied. As she battles the traffic in the crowded streets, she steps on the curb in order to hail a taxi. An old woman, a sick, elderly man in a wheelchair, and a tall, dark haired man attempt the same action. They smile and exchange conversation in their limited English. Alexandra snaps a photo and wishes them well as she helps them and their baggage into a taxi. What transpires hereafter will take you quite by surprise. Alexandra looks down and notices that the little traveling party has inadvertently left behind a black bag. Upon opening it, she beholds a hand-carved box containing an urn filled with ashes and engraved with the name Stoyan Lazarov. Our Alexandra has a king's ransom of guilt deep within her soul from her brother's death. She left him on a mountain path alone and trudged on without him. This time would be different. This was someone's loved one who would not be left behind. So Alexandra takes on this mission to find the Lazarov family. She hails a taxi driven by Bobby who will become her greatest ally in Bulgaria. Kostova presents a storyline imbued with Bulgarian history of the past that seeps into the present and saturates it profoundly. The emphasis is on a journey taken so readily by Alexandra with hope lining the windshield. The Shadow Land is rich with its characterizations. Kostova goes deep. You feel the remorse of Alexandra that parallels with the penitent nature that gnaws through many of the other characters. Each individual along the winding roads serves as a stepping stone in the search to find the Lazarov family. If you've read anything by Elizabeth Kostova before, you know that she hands over a weighty novel. This one is no exception. Kostova is an stellar storyteller by her very nature. Be prepared for that as she takes you through the winding streets of Sofia and beyond. But the underlining message is what drives humanity in this world. Is it the true essence of kindness in the likes of Alexandra or is it something far darker and more menacing below the depths of blackened hearts? I really liked this novel, the characters had depth and I got to learn a lot because I didn't know much about Bulgaria. The pacing was good too and I honestly did not know where the story was leading which was nice because I hate reading mysteries and knowing ten pages in what's going to happen. That said I found it kind of awkward the way point of view kept switching, not just from person to person but from first person to third as well. It interrupted the flow and was not needed. Also the way I really liked this novel, the characters had depth and I got to learn a lot because I didn't know much about Bulgaria. The pacing was good too and I honestly did not know where the story was leading which was nice because I hate reading mysteries and knowing ten pages in what's going to happen. That said I found it kind of awkward the way point of view kept switching, not just from person to person but from first person to third as well. It interrupted the flow and was not needed. Also the way the book was divided up into chapters but would divide a chapter up in the middle of the narrative when something was happening was pretty annoying as well. The beginning was slow but about half way it picked up and I really enjoyed the parts that were from the past especially. I do think a lot of the stuff could have been cut off from the story line without taking away from the plot. The ending was also unnecessary, they could have ended it a chapter or so before. Still I really enjoyed the book and I liked the writing very much, most of the problems with the book were just about writing too much which I think is a preferable problem to things like boring plots or flat two dimensional characters. Alexandra Boyd has travelled from America to Sofia, Bulgaria’s capital city. She chose Bulgaria largely due to her brother’s fascination with the area in a geographical game they used to play as children. Since Jack is no longer able to make this dream a reality Alexandra has gone in his stead, arranging a teaching post to augment her scant resources. Shortly after her arrival at the wrong hotel in Sofia, she reaches out to prevent an older woman from a near fall and in her efforts then to as Alexandra Boyd has travelled from America to Sofia, Bulgaria’s capital city. She chose Bulgaria largely due to her brother’s fascination with the area in a geographical game they used to play as children. Since Jack is no longer able to make this dream a reality Alexandra has gone in his stead, arranging a teaching post to augment her scant resources. Shortly after her arrival at the wrong hotel in Sofia, she reaches out to prevent an older woman from a near fall and in her efforts then to assist the lady and her travelling companions, she inadvertently ends up in possession of one of their bags. Despite her resolve, locating the rightful owners of the urn, who Alexandra has since learned contains the ashes of a deceased musician named Stoyan Lazarov, proves difficult and leads Alexandra and her taxi driver Bobby across the country and up into the mountainous regions of Bulgaria. Each new stop reveals a little more of Stoyan’s history and the political unrest of the times through which he lived. Stoyan’s history is told through a series of flashbacks, involving communist labour camps and the inhumane deprivation of political prisoners. Their treatment is so merciless and unsparing, that in order to survive, Stoyan has to escape to a place of his own building, deep within the recesses of his mind. Brilliantly handled by Kostova. His is a past full of secrets with disturbing ties to the current day political landscape of Bulgaria. But Stoyan’s past is also full of music and Kostova’s description of this, his first love, as Stoyan plays his beloved violin, is stunning in it’s power to transport the reader. I felt as though I too were standing in that tiny bakery, listening with bated breath, heart swelling, as Vivaldi's notes danced and rippled through the architecture of my ears. Alexandra has her own history to overcome. Her brother Jack disappeared forever years ago on a hiking expedition with her family, and Alexandra harbors her own feelings of guilt about the role she played on that fateful day, and it is perhaps this very need to atone for her own perceived sins, that is the driving force behind her resolve to return Stoyan’s ashes to their rightful resting place. I thoroughly enjoyed this trip across Bulgaria and no doubt learned something of it’s history in the process, without ever leaving the comfort of my armchair. Not a bad way to travel. Almost from the beginning I found the story problematic, the storyline that leads to the books true purpose struck me as unbelievable. If you visited a foreign country, didn't know the language, stopped to help someone, and found you mistakenly had come to posses the ashes of someone who belongs to the people you helped, would you travel around the country trying to return said ashes? Would you get into a cab, the driver a young man you do not know, and travel back and forth across the country, Almost from the beginning I found the story problematic, the storyline that leads to the books true purpose struck me as unbelievable. If you visited a foreign country, didn't know the language, stopped to help someone, and found you mistakenly had come to posses the ashes of someone who belongs to the people you helped, would you travel around the country trying to return said ashes? Would you get into a cab, the driver a young man you do not know, and travel back and forth across the country, now mind you no one knows where you are, trying to find these people? I do mean back, and forth for over half the book, a few clues gathered here and there. On the plus side the descriptions of the country were beautiful, Bulgaria a country I am not very familiar with, but the receptiveness and the tedium of learning the same thing, just in different cities really slowed the pacing. The last third of the book when we learn of the imprisonment of the man who is now ashes, his treatment and the treatment of the other prisoners was the best part, the strongest writing and the most interesting. In my opinion this book is best suited to those who can suspend belief and accept the basic premise. If you are the type of, person who can pan for gold for four days or so just to come up, with a few nuggets, then this book will work better, it does require patience. Many readers, from some of the ratings, are these type of readers, I am not. Grab me quick and don't let go is my reading motto. There were some nuggets of gold here, the music, Vivaldi being a safe place and I adore that musicians music. The scenery as I said was gorgeous, learning a bit about a country new to me, all pluses and some of this countries history.. Just don't know if I would have had the patience to persevere to discover these if this wasn't a buddy read with Angela and Esil. There are a number of things that I liked about this book and some that didn't work so well for me, leaving me with a rating of 3 stars and an extra half star for the dead man whose ashes and life become the focus of the novel. I found myself very engaged in Alexandra's story initially. The back and forth in time giving us a view of her past, how she came to Bulgaria and the deep loss she feels about losing her brother Jack, was very moving . I was engaged in the search she embarks on with Bobby, a taxi driver she connects with, to return a bag with the ashes of a man named Stoyan Lazarov, that she mistakenly comes to have in her possession. I loved the descriptions of the places in Bulgaria where they traveled and learning a bit of this country's history. I loved the historical sections of the book where we discover the man whose ashes they carry around . This for me is where the story comes to life. At some point, though the search felt like a wild goose chase and I just wanted it to be over. I only became reengaged when the story focused on Stoyan, the only character I felt was fully realized. He was the only character I felt I knew and I have to give that extra half star for how the gut wrenching story of his time in a prison camp and his passion as a musician lets the reader know him . It was both heartbreaking and uplifting that he imagines playing his violin, his beloved Vivaldi to keep from losing himself. What we know about Alexandra and Bobby come to us in snippets of facts not through seeing who they are through what they do. I didn't get why there was such a mystery about Bobby and knowing earlier that he was more than just an activist taxi driver wouldn't have made a difference to the story if we knew earlier. While I enjoyed parts of this book, it felt somewhat overwritten at times. Thanks once again to my friends Diane and Esil for our third read together. It's always a pleasure to be enlightened by their thoughts! I received an advanced copy of this from Text Publishing through NetGalley. This book is a train with many cars, the old kind, moving clumsily along a track at night. One car contains a small supply of coal, which splits out into the passageway when an internal door is opened. You have to step over piles of slippery black grit to get through the corridor. Another car contains grain, shipped for export. One car is full of musicians and instruments and cheap overnight bags, nearly half an orchestra sitting according to their friendships and rivalries in the seats of the second-class compartments. Another car contains bad dreams. The final train car has no seats but instead is full of sleeping men, who lie crushed together on their coats in the dark. The door to that one has been nailed shut from the outside. Alexandra Boyd is seeking something, a peace of some kind she’s unable to find at home in the Blue Ridge Mountains of North Carolina, a home where she once roamed with her brother Jack. Where Jack walks no more, missing since the day they had an argument and she told him to “get lost.” Trying to get away from all the memories for a while, she arrives in Sofia, Bulgaria with an upcoming teaching position, teaching English to Bulgarian students. Bulgaria – Jack’s favourite country on the atlas when they were young, which was that perfect shade of green. Alexandra’s favourite always Yugoslavia. She had shown the note with the name of the hostel written in Cyrillic script, to the Airport taxi driver, and trusted him to deliver her to the correct place. After she’s dropped off, she realizes too late that this is not the place, and in her confusion she ends up standing next to an older woman, an elderly man in a wheelchair, and another, younger, man while they’re trying to hail taxis. A brief conversation ensues, their English is sufficient for that. She is so pleased with meeting such friendly people, she asks if she could take a photo of the first people to be kind to her in this country, so new to her. With bags placed in proximity, amid the need to get the elderly man in the cab first, a bag of theirs ends up among Alexandra’s things, and it is only after she is safely in her own taxi driving some minutes away that she realizes the mistake. And even later, she realizes the gravity of that mistake. It isn’t just someone else’s precious family possession she holds in her hands – it’s their actual family – an urn containing the prah, their ashes. Kostova effortlessly weaves in fairly-tales, horror stories of prisoners in camps, the beauty of so many places in Bulgaria, love stories, and messages of hope. Some parts are heartbreakingly sad, horrifying, other parts let enough of the good through, so you can breathe easily and calm your heart, and perhaps even charm you. All through, the past that haunts Bulgaria is woven through this story until it meets the present, those who know of the stories but never really knew. Music is a profound presence in this story, as one of the main characters of the past was a violinist, classically trained, and I found myself wishing I could listen to these pieces as I read through those sections. The descriptions of various locations are often so lovely that I would pause and read them once more. I felt as if I had been transported to the setting, again and again, by music or the magic and power of Kostova’s writing. There is a part that deals with the ugliness of the past, a past we know a variation of, or think we know, or maybe even know a bit about it. We’ve heard or seen a paragraph or two or a documentary or perhaps saw a special show on it once upon a time. And we’ve become complacent thinking this was so long ago, it’s the past and not the present – and, perhaps more importantly, we didn’t live it. People die, ideas don’t. They return, reincarnate. We need to remember that people let this happen. Allowed this to happen, maybe even when they didn’t want it to happen. Overall, this is lovely. An assessment of the power we have to find significance and faith, optimism in the past, despite the despair. To remember, to cherish those things worth cherishing and to leave behind those things that have the power to destroy. Many thanks for the ARC provided by Random House Publishing Group - Ballantine! Alexandra’s brother disappears on a family hike when he is 16 and she's 14. As a twenty-six year old, she travels to Sophia, Bulgaria because it was her brother’s desire to have traveled there. She has no sooner arrived that she accidentally picks up a suitcase that contains someone’s ashes. And so it begins. This is a beautifully written, wonderfully detailed book. Kostova paints a picture with each chapter so that you can visually picture everything happening. You feel as much the outsider as Alexandra’s brother disappears on a family hike when he is 16 and she's 14. As a twenty-six year old, she travels to Sophia, Bulgaria because it was her brother’s desire to have traveled there. She has no sooner arrived that she accidentally picks up a suitcase that contains someone’s ashes. And so it begins. This is a beautifully written, wonderfully detailed book. Kostova paints a picture with each chapter so that you can visually picture everything happening. You feel as much the outsider as Alexandra, trying to make heads or tails of this country with a language that you don't speak that sounds nothing like English and doesn't even share an alphabet. You gradually are given the story of the man whose ashes Alexandra is carrying around. There is a bit of mystery to this story. Not only the story of Stoyan Lazerov, but why is someone following Alexandra and Bobby, her taxi driver/friend and damaging his car. This is not a fast paced novel. It takes its time, moving from location to location, time to time. I felt that Stoyan’s time in the labor camp was especially slow and would have been better if compressed. The ending isn't believable but it is satisfying. Of course, the entire premise of the book isn’t what you’d call believable. Ther are way too many coincidences and lots of leaps of faith required. But if you’re willing to suspend your critical thoughts about that, the book is very enjoyable. This novel is by Elizabeth Kostova, who is, of course, best known for her wonderful novel, “The Historian.” As such, if you are looking for more of the same, you may well be disappointed by this novel, which would be a shame. This is a very different book, but it contains much that is very special indeed and is – as you would expect – beautifully written. The story begins with a young American woman named Alexandra Boyd, who has travelled to Sofia in Bulgaria, in order to teach and to recover fro This novel is by Elizabeth Kostova, who is, of course, best known for her wonderful novel, “The Historian.” As such, if you are looking for more of the same, you may well be disappointed by this novel, which would be a shame. This is a very different book, but it contains much that is very special indeed and is – as you would expect – beautifully written. The story begins with a young American woman named Alexandra Boyd, who has travelled to Sofia in Bulgaria, in order to teach and to recover from the loss of her beloved brother, Jack in a hiking accident. It is obvious that Alexandra blames herself for the loss and that she has travelled to Sofia, largely as it was a country that Jack always wanted to visit. On her very first day, in the first in a long line of odd events, she is taken by her taxi to the wrong hotel. Tired, disorientated and yet knowing that she cannot afford the expensive hotel she has been dropped at, she turns to take another taxi. While waiting, she speaks to a group of people, including an elderly couple and another man. One of their party is in a wheelchair and, while assisting them into a taxi, Alexandra finds herself left behind with one of their bags. Burdened with her own luggage, she does not realise this until she is in her own taxi, driven by the man who is to become her companion on the strange journey she is about to embark on. For, inside the bag is an urn, containing the ashes of a man named Stoyan Lazarov and Alexandra and cab driver, Bobby, set off to find the relatives of Stoyan Lazarov and return them. Along the way, Alexandra will discover the life story of the man whose ashes she carries so carefully and, through his life story, the history of the beguiling, beautiful and, often difficult, history of the country that is Bulgaria. It is also the story of how Alexandra herself comes to terms with her own history and a place for herself in the world. This is a very moving, quietly deceptive novel, which you need to take at a slower pace – very much character, rather than plot, driven and masterfully written. I received a copy of the book from the publisher, via NetGalley, for review. The language in this book is beautiful, mesmerising and detailed. If you wish to get lost in the wonder of Bulgaria, then this is the closest you'll get to the experience of being there without actually going. It made me want to pack bag and head off into the unknown, to feel that sense of trepidation and excitement that only happens when you go to a place you've never been before and don't speak the language. But...that's where the talent lies in this book. The words are perfectly crafted and e The language in this book is beautiful, mesmerising and detailed. If you wish to get lost in the wonder of Bulgaria, then this is the closest you'll get to the experience of being there without actually going. It made me want to pack bag and head off into the unknown, to feel that sense of trepidation and excitement that only happens when you go to a place you've never been before and don't speak the language. But...that's where the talent lies in this book. The words are perfectly crafted and evocative, but they have no real meaning as a function of the overall narrative. Unless you consider again the value of the language, so much of it is unnecessary. The plot never finds itself, it has wandered so far from the path that the reader feels adrift. Those intrepid ones who stick it out till the end are far from rewarded, it stretches the boundaries of belief too far. This is a love story to the country of Bulgaria. It's a place I can safely say, I have not thought much about before this book. It's always been one of those gray places behind the Iron Curtain to me but I have a different view now. It's a place of history and great beauty and a wonderful place to explore. Alexandra is still recovering from the sudden and unexpected death of her brother in a tragic accident when she decides to go to Bulgaria, a place he had always wanted to visit. She is going t This is a love story to the country of Bulgaria. It's a place I can safely say, I have not thought much about before this book. It's always been one of those gray places behind the Iron Curtain to me but I have a different view now. It's a place of history and great beauty and a wonderful place to explore. Alexandra is still recovering from the sudden and unexpected death of her brother in a tragic accident when she decides to go to Bulgaria, a place he had always wanted to visit. She is going to teach English there. Nothing goes right. The taxi takes her to the wrong hotel and she runs into some people having problems getting in their taxi so she helps out. When they leave she discovers she has one of their bags and it contains human ashes. Alexandra makes it her mission to return the ashes. She runs into a helpful taxi driver who remarkably speaks English. They go on an adventure to discover the people and return the bag but it turns out there is much more to the story and they are being pursued and the people have mysteriously disappeared. As she wanders around Bulgaria it enfolds in front of us. There are villages with stone houses built into mountains, wooden house villages by the sea and monasteries. It becomes apparent that this is a moving travelogue to Bulgaria disguised in a mystery. It's very effective. They learn more about the man whose ashes they have and the history of Bulgaria unfolds. It centers around Russian labor camps where enforced labor was used to mine rocks. I must be getting old because man's inhumanity to man becomes harder and harder to understand and what happens in the Labor Camp is inhuman. And it is at the Labor Camp that the story really speaks to me. It shows what as humans we are able to endure. How people are treated so harshly and yet survive. I can tell you that I don't feel like I could endure long with a breakfast of a polluted cup of water with a smear of jam on the lip and then go out break up stones. Yet they do day after day. It also speaks to what sustains us in times of trouble. What makes you get out of bed every morning and live through the trials. I am in awe of what people can do. If you loved The Historian as much as I did and even if you didn't love The Swan Thieves to the same degree (I loved it in a different way from Elizabeth Kostova's first novel), you will probably love The Shadow Land. In each book, we have a literary writer who also never fails to include mystery, romance and the sense of a thriller while covering parts of history that at least I did not know before. Alexandra Boyd is similar to other female characters in Ms Kostova's books. At first I found her If you loved The Historian as much as I did and even if you didn't love The Swan Thieves to the same degree (I loved it in a different way from Elizabeth Kostova's first novel), you will probably love The Shadow Land. In each book, we have a literary writer who also never fails to include mystery, romance and the sense of a thriller while covering parts of history that at least I did not know before. Alexandra Boyd is similar to other female characters in Ms Kostova's books. At first I found her a little too bewildered and passive, but then at the beginning of the story she had just arrived in Bulgaria after more than 24 hours of air travel, jet-lagged, under slept and a stranger to the country. As the novel progressed she proved to have a strong sense of what she felt was right and to follow that sense despite fear and doubt. The ashes she mistakenly came to possess on that groggy morning in Sophia turn out to be the remains of the talented violinist Stoyan Lazarov, who was prevented from living the life of a celebrated touring musician because of the political turmoil of his home country. He spent years in Communist work camps where his hands were ruined and his dreams destroyed. In order to return the musician's remains to his family, Alexandra must learn the history of Lazarov's life and penetrate a great deal of secrecy and fear. She turns out to be a determined young woman with an abundance of courage. Once again I learned the history of a country I could barely find on a map. There is so much to learn about the world that I don't like to spend time berating my ignorance. A novel that can teach me so much in under 500 pages while keeping me on the edge of my seat the whole time as well as introducing me to such vivid characters is something extra special. I even got some insight into the current political scene in the world. Después de unos días digiriendo este fabuloso libro, aquí estoy plasmar todo lo que me transmitió esta lectura. Empecemos por el argumento: Alexandra Boyd es una chica estadounidense que viaja a Sofía, la capital de Bulgaria (yo no sabía ese dato hasta empezar el libro), con la esperanza de que un cambio de aire en el extranjero le ayuden a superar la pérdida de su hermano mayor. LLegando a la ciudad, ayuda a una pareja de ancianos a abordar un taxi y accidentalmente se queda con una de sus bolsas. Dicha bolsa contiene una caja labrada con un nombre: Stoyan Lazarov, y dicha caja contiene cenizas humanas. "La historia de mi vida la dejaré en mi música." A partir de allí, Alexandra emprende un viaje por toda Bulgaria con el fin de locarizar a la familia de Stoyan Lazarov, teniendo que, inesperadamente, develar los secretos del pasado de un músico talentoso cuyos sueños y metas se vieron trucados por una guerra y el comunismo. "Año 1944, en primavera los bombardeos eran tan constantes y fuertes que nos sentíamos atrapados en una pesadilla... Stoyan tocaba a veces el violín para nosotros a oscuras en el sótano. Decía que los aviones volaban tan alto que no podían oírle. Estoy segura de que si esos pilotos hubieran podido escucharle, habrían dejado de tirar bombas y nos habrían dejada en paz para siempre." Inicié este libro a modo de prueba, me dije: 5 capitulos y veré si me engancha para seguirle; ya yo en el capítulo 2 estaba encantada con la autora y primera vez que leo algo de la misma. Tierra de sombras es un libro que se divide en 3 partes y aunque desde el inicio uno se ve medio perdido con el argumento, la intriga atrapa cuando la protagonista emprende la búsqueda. El libro va develando secretos e incluyendo personajes; todo se centra en uno en particular, Stoyan, un violinista prodigio, fiel admirador de Vivaldi, que no pudo hacer carrera musical ni terminar sus estudios por culpa de la guerra. "No permitiría que nadie accediera al centro de mi ser; me fabricaría un lugar al que poder escapar en lo más hondo de mi yo, pasase lo que pasase." A medida que avanza, la historia se cierne un peligro sobre la protagonista, y Alexandra tendrá que averiguar por qué parece haber tanta gente buscando las cenizas y qué secretos se enconden en el pasado del músico. ¿Qué tiene este libro para que me gustara tanto? La parte histórica, como dice la autora en sus notas, toca un tema hoy en día poco conocido para los más jóvenes como lo fue la época comunista y la guerra que se dio en Bulgaria; los campos de trabajo forzado, los encarcelamientos por supuestas conductas anti-patrióticas y una gran cantidad de ciudadanos que pagaron condena en dichos campos sin juicios. Es un libro sólido muy bien documentado. La parte musical támbien es un punto a favor, a mí personalmente me gusta escuchar música clásica y todas las obras aquí citadas iba reprodiciéndolas. El final del libro, aunque debo admitir que se me volvió un poco pesado en algunas partes y lento, fue muy bello. Si eres lector de ficción histórica, y como yo, te encanta las historias ambientados en la guerra, este libro es super recomendado. I received a copy of The Shadow Land from Netgalley in exchange for an honest review. I really wanted to like this one but I struggled with it from almost the beginning. I love historical fiction and I especially love it when there are parallel past and present stories being told. I should have known, however, that it might not work for me as reviews of Elizabeth Kostova’s other novels run the gamut from superb to long and boring. Unfortunately, in this case, The Shadow Land is slow and very wo I received a copy of The Shadow Land from Netgalley in exchange for an honest review. Unfortunately, in this case, The Shadow Land is slow and very wordy. Her writing, when it is not overly descriptive and repetitive, is lovely but there are so many instances where an editor could have gone in and easily slimmed things down. I think the biggest issue for me is the modern day portion of the story. It is so monotonous and exasperating at times. The past story is more interesting but I found navigating through the present narrative turned me off the book. The present account follows Alexandra Boyd who has come to Sofia, Bulgaria, for a position teaching English. After an interesting chance meeting with an elderly man and woman and the younger man accompanying them, she gets a taxi to take her to her hostel. On the way, she discovers she has accidentally picked up one of their bags and, when she opens it, she discovers an urn full of ashes inside. The only clue she has is an engraving: Stoyan Lazarov. She asks the taxi driver to take her to the police but instead of leaving the bag and urn with them, she decides to take them with her and try to find the owners. The taxi driver, a man named Bobby, agrees to drive her to the monastery that the younger man had mentioned they planned to visit. The trio is not there and they do not appear to have been there and this begins Alexandra’s countryside tour of Bulgaria with a complete stranger. This is where I started to tune out. I found her need to scour the Bulgarian countryside for the owners of the urn to be an odd choice (supposedly partially motivated by her guilt over her brother’s disappearance when they were kids). Sure, she feels bad about picking up the bag but she’s never been to this country before and she doesn’t even speak the language. Bobby is oddly accommodating in her need to traipse around Bulgaria. They begin at an address provided by a policeman as a possible starting point for them to find information on the trio. After they visit that address, they ping all over the countryside, visiting various people who relate the sad tale of Stoyan Lazarov, a violinist. Lazarov’s tale is harsh, illustrating the horrors and violence of the past and the political unrest of the time - the effects of which are still felt in the modern story. But it just drags. There was a time I devoured big, fat historical novels but maybe I’ve grown impatient with overly wordy writing. I felt like there was a lot that could have been removed and it would not have affected the plot. Another thing that really bugs me is the tenses. The book starts with Alexandra’s third person POV. Then the book rolls back to over a decade ago when her brother disappeared and, all of sudden, it is in Alexandra’s first person POV. With the past sections concerning Stoyan Lazarov, they are related in third person and at some point switch to Lazarov’s first person POV. It’s very confusing and inconsistent. some reviewers have compared shadow lands to the historian. where kostavas debut novel was longer in length it was fast paced shadow lands isn't at all fast paced. but the writing is more mature kostova seems surer of herself in her latest novel. the slow pace was frustrating at moments to me because I am a very plot heavy story driven reader. but once i settled into the lush language of this title I relaxed enough to appreciate there are many ways to tell a story. in other words if you just read the surface text of kostova's novel you may miss the amazing layer of depth the subtext holds. I loved this title despite being as aforementioned a plot heavy reader and hopefully others will too. This book takes place entirely in Bulgaria. It starts with an American woman, Alexandra Boyd, dropped off at the wrong hotel by a taxi that is now gone. She is trying to decide how to get another taxi and get to the hostel where she has a reservation when she steps up to stop an elderly woman from falling. The two men with her thank her before they get into their taxi. She asks permission to take their picture and they leave after she takes the picture. Only then does she discover she has mistak This book takes place entirely in Bulgaria. It starts with an American woman, Alexandra Boyd, dropped off at the wrong hotel by a taxi that is now gone. She is trying to decide how to get another taxi and get to the hostel where she has a reservation when she steps up to stop an elderly woman from falling. The two men with her thank her before they get into their taxi. She asks permission to take their picture and they leave after she takes the picture. Only then does she discover she has mistakenly taken one of their bags. She opens it and discovers an urn of ashes. The two narratives do connect at the end of the book for a very satisfying ending. This book brought back memories of my two months in Bulgaria, volunteering as a UN Sanctions Assistance Monitor in the summer of 1993 during the Bosnian war. Doorways into shops with ribbons or bead from the top of the doorway to the floor. Excellent and very cheap wine. I was at a restaurant with colleagues. I ordered a glass of wine. I spoke almost no Bulgarian. The waitress spoke very little English, but told me that I could not order a glass of wine. I must buy the whole boutelika, which turned out to be $2 for the bottle. The Rila monastery, not mentioned in the book, but a UNESCO World Heritage site that I visited. Alexandra visits a fictional monastery driving through fictional mountain villages that are familiar to me. Fall of the Berlin wall "Actually, it was all to the credit of Pink Floyd. They built the wall and they made it fall down one little piece at a time." Doorway "In the field beside them stood a doorway, all by itself--no house, no door--just the frame and a few concrete blocks." Smile "That smile--so handsome it made the sun come out." I am counting this for Bulgaria in my UN mystery challenge. Violinist "He said the violin should be able to tell the truth and it should be able to cry." Thank you to NetGalley for providing a free ebook copy of The Shadow Land By: Elizabeth Kostova in exchange for an honest review. I was very excited to read The Shadow Land since I loved The Historian by this author so much. The Historian is one of my favorite novels, but this one did not do it for me. The writing in this one killed me from about page two. I feel like unimportant things are described in too much detail. The writing droned on and on. I felt like I had been reading forever and I wasn't very far in. To be honest, I only made it to 5% and I had to quit. Wow. Overall The Shadow Land is a pretty disappointing read for me and I'm sad I had to DNF so early on. This book to me did not feel like the same writing that I loved in The Historian. Not everyone can be Tolkien and not every book needs that level of description. I couldn't get into this one at all so I figure why keep going if I already really dislike it? I can't personally recommend this one, but if the blurb sounds good and you can handle long winded descriptions then maybe you'll like this one more than I did. I'm giving this one 4 stars, however it's pulled up from 3 based on the wealth of historical knowledge written into it. I'm a big fan of historical fiction, particularly when it's deftly done so that a good deal of historical information can be woven in with the story without feeling like a textbook, which Ms Kostova achieved. But, it was a little slow moving and boring. Her first book, "The Historian", is one of my favorite books of all time. So I was really excited to get my hands on this one, I'm giving this one 4 stars, however it's pulled up from 3 based on the wealth of historical knowledge written into it. I'm a big fan of historical fiction, particularly when it's deftly done so that a good deal of historical information can be woven in with the story without feeling like a textbook, which Ms Kostova achieved. But, it was a little slow moving and boring. Her first book, "The Historian", is one of my favorite books of all time. So I was really excited to get my hands on this one, and had very high hopes. It didn't live up to my expectations. It wasn't bad... it was actually quite good... but it was a little dry, and drug a little bit. I think a good chunk of pages could easily have been condensed out of it without losing any of the story elements, and have made it move along at a more page-turning pace. Really, though, the amount and depth of knowledge Ms Kostova displays of Bulgaria and communist Bulgaria must have taken a fair bit of time to acquire. She uses the information easily and with good detail, really bringing it to life for me. While I might not suggest this book to an adrenaline junkie, lovers of history and knowledge might appreciate it very much. *An ARC of this book was provided by Random House Publishing and Ballantine Books in exchange for an honest review. Thank you for making this available. "Obey and hate yourself, survive. Disobey, redeem yourself, perish." I received a copy of The Shadow Land from Ballantine Books (NetGalley) in exchange for an honest review. This does not persuade my actual opinion of the novel. As soon as I started this novel, I knew I was going to love it. The way Elizabeth Kostova's flawless writing paints an image in your mind is absolutely remarkable. Honestly, I enjoyed nearly every moment of this book. I enjoyed the history, the rare but exhilarating thriller scenes, the constant mystery, and even the I received a copy of The Shadow Land from Ballantine Books (NetGalley) in exchange for an honest review. This does not persuade my actual opinion of the novel. As soon as I started this novel, I knew I was going to love it. The way Elizabeth Kostova's flawless writing paints an image in your mind is absolutely remarkable. Honestly, I enjoyed nearly every moment of this book. I enjoyed the history, the rare but exhilarating thriller scenes, the constant mystery, and even the slow-burning romance. Ah, this was quite an enjoyable read. Some people might compare this novel to The Historian, but not me. To put it simply, I didn't enjoy that novel as much, which is why I'm really glad I gave this book a chance - even though I didn't have the greatest success with her novels prior. And who knows? Maybe I'll even go back and re-read The Historian because of how amazing this story was. Honestly - I'm still in awe. Another thing I might add is, that even though this was beautiful - it's certainly not for everyone. If you don't enjoy books with "little action" and a "slow burn" then, this isn't for you. But even still, I dare you to give it a chance. It might just be one of my favorite Historical Fiction novels I've read recently. But now...I just have to wait for the release date, so I can have the physical copy of the book! Dorothy's quest to meet The Wizard. As I am writing this, (all proud of my cleverness)I realize there is a character named The Wizard. (Duh) But he actually isn't the THE Wizard. Our Dorothy, Alexandra, is a young woman newly arrived in Sofia, Bulgaria to teach. Alexandra is also on a pilgrimage of sorts for her brother who died young in a hiking accident. Alexandra is almost destroyed by her burden of guilt. So when by trying to do a good deed for a small little family group, she ends up with c Dorothy's quest to meet The Wizard. As I am writing this, (all proud of my cleverness)I realize there is a character named The Wizard. (Duh) But he actually isn't the THE Wizard. Our Dorothy, Alexandra, is a young woman newly arrived in Sofia, Bulgaria to teach. Alexandra is also on a pilgrimage of sorts for her brother who died young in a hiking accident. Alexandra is almost destroyed by her burden of guilt. So when by trying to do a good deed for a small little family group, she ends up with cremains, Alexandra is horrified. Unh uh, no way is she going to bear this guilt. Alexandra meets up with her Scarecrow, a taxi driver named Bobby, who joins her on this quest to find three people in Bulgaria when she doesn't know their name, phone, or address. Although she soon catches a break on the name. Bobby is the ultimate Scarecrow with skills and secrets of his own. Everyone should be so lucky as to have a Bobby in their life. Alexandra and Bobby's journey on the YBR is a physical and historical journey through Bulgaria. A journey of light and darkness. Early on they discover the name of the man whose remains they hold, Stoyan Lazarov, a violinist of exceptional skill. It is his story we begin to learn. The story of his incredible skill as a violinist, his abiding love for his Vera, and his long dark journey into the hell of the Bulgarian gulags. Alexandra and Bobby find themselves in danger almost from the beginning. It takes a long while to discover by whom and even longer to discover why. As Alexandra and Bobby begin to meet Stoyan's family and friends, they discover his journeys into hell are almost balanced by the beauty of these F and Fs. Kostova paints her characters as lovingly a Sargent or a Casset. There is a distraction at first when some of the chapters are told by Alexandra's POV, This distraction soon disappears. This about the only discordant note I can think of. I don't think I have to words to describe Kostova's description of Stoyan's music. Her descriptions, are, well, music. But all of Kostova's descriptions are lovely. Sometimes I just skim wordy descriptions, in Kostova's case I savor her words. For all the right reasons, this book takes commitment. It is a journey well worth taking. "Do you like Bulgaria? People say that it is the place where anything will happen. Can happen, he corrected himself." A young American woman, Alexandra Boyd, lands in Sofia, ready to teach English and explore a country that fascinated her brother as a young child. Really, who among us knows much about Bulgaria? If the descriptions in this book are any indication, many more readers may be setting their sights on this fascinating (if largely unknown) nation. One of the most profound statements in the book comes from Alexandra's main Bulgarian companion (a poet and taxi driver) in which he tells her that in her country, no one cares about history and in his, no one can escape it. In particular, Alexandra becomes unexpectedly wrapped up in an adventure not of her own choosing. She's outside a hotel and spots an elderly couple having trouble getting into a taxi and goes to help them. She unwittingly ends up with one of their suitcases, and spends the rest of the book trying to return this to them. This is no ordinary matter, however, for it contains the ashes of a Bulgarian musician, making it even more important that the urn/suitcase find its way to its rightful owners. From one end of the country to another, Alexandra follows the clues. As readers learn more and more about the fate of the man behind the ashes, the story becomes darker, but no less meaningful. This is a rich tale with plenty to share, and not all of it is goodness and light. It is certainly worth the journey, however. What Kostova has to share with her readers is profound, and there's even a little twist at the end, just to round things off. A wonderfully written, important book. I'm completely emotionally drained...there's nothing left...between tears, adrenaline and sheer loss of sleep as my dreams were marred from scenes of this book...this book took everything out of me...and I LOVED IT. There is a character in this novel, that completely captured my heart; a person that you never meet in the book...and yet I feel that I know him so deeply. I have often been obsessed by the notion of a person so beautiful/pure/kind/radiant that others simply bask in their light and are drawn to them. When someone draws loyalty throughout their entire lives; a sense of reverence from those in their lives it seriously melts my heart. We are transported to Bulgaria, and a trip a young Alexandra Boyd needs to make to start her own healing process in her life. Once there, she very quickly meets a man and his family and by accident keeps one of their bags. Inside that bag is an invaluable find...which leads the rest of the story in motion. I truly feel that I am a better person for reading this novel. The only issue I had with it was that it was a tad long-winded in the descriptions department. Let's just say, it was obvious that the author LOVES Bulgaria! The actual rating for this book was 3 1/2 stars. First I have to thank Netgalley for giving me the chance to review this book that is not coming out till a couple of months from now. One of the main issues I had with this book started as soon as I began to read it , the catalyst that launches the plot of this book is not believable at all and every part that follows from there on is tainted by this lack of cohesion at the begging of the book. That aside, the book gets better from then on but it i The actual rating for this book was 3 1/2 stars. I was curious about this novel after reading both The Historian and The Swan Thieves by this author. I have grown accustomed to complex novels that still move quickly, usually discussing art or literature in some way. I was disappointed by The Shadow Land. It is very clear that the author has fallen in love with Bulgaria (and a Bulgarian!) and wanted to write a novel that expressed it. So she created this novel as a framework. The first half of the novel contains a lot of movement from place to p I was curious about this novel after reading both The Historian and The Swan Thieves by this author. I have grown accustomed to complex novels that still move quickly, usually discussing art or literature in some way. I was disappointed by The Shadow Land. It is very clear that the author has fallen in love with Bulgaria (and a Bulgarian!) and wanted to write a novel that expressed it. So she created this novel as a framework. The first half of the novel contains a lot of movement from place to place, I imagine because she wanted to write about some of these places with such rich history, but some of these places have no bearing on the outcome of the story. The characters are too obviously pawns and the events are too implausible. Some opportunities were missed - the main character is there to teach English yet everyone she meets speaks good enough English, even the elderly. I'm pretty sure the timeline of her adventure overlaps with when she was expected in the classroom but this is not addressed. Her taxi driver has indicators of revolutionary activity (at least resistance) but this is pretty much dropped midway through the story (and was possibly the most interesting story line to me.) One story that seems to tie everything together is told unevenly, and contains the elements of most confusion. Despite my complaints I did learn some things about Bulgaria in World War II, and the ancient people called the Thracians. I can see why the author is in love with this place. But I think the story she chose to tell inside of it was not a success. Another 5 star book by a wonderful story teller- Elizabeth Kostova. I was fortunate to receive an advance copy of "The Shadow Land". This is a book that in my opinion must be read slowly, and not rushed through to fully appreciate. A story that captures a time and era in Bulgaria, that is real, sad and true during a communist period that held many secrets, and affected so many lives and families. As with "The Historian"I had a hard time putting down and would highly recommend. This is storytelling a Another 5 star book by a wonderful story teller- Elizabeth Kostova. I was fortunate to receive an advance copy of "The Shadow Land". Oh how I love Ms. Kostova's writing. She is certainly talented and can pull people, places, and things into existence out of thin air. This one was a slow burn, really really slow. Too slow for my tastes but I am sure others who can appreciate that sort of thing will love this. The Shadow Land is the third novel by American author, Elizabeth Kostova. In May, 2008, Alexandra Boyd leaves her North Carolina home and her job as a librarian to take up a teaching position at the Central English Institute in Sofia, Bulgaria. But on her very first day in the country, through a mix-up, she ends up with a bag not her own, one that contains an urn of ashes. Alexandra is distraught at the thought that Stoyan Lazarov’s family are heading to the Velin Monastery in Rila without his remains. Her taxi driver, Asparuh Iliev (just call me Bobby) obligingly returns her to the spot where the unfortunate mishap took place, to no avail. A visit to the Police Station sets them on a path that becomes almost a quest: a quest to see the urn returned to the family. In the process of this far-from-straightforward mission, they learn a great deal about the life of the man whose remains they are carrying with them. As well as the third person narrative of present day events from Alexandra’s perspective, there are some chapters describing her motivation for travelling to Bulgaria. Stoyan Lazarov’s story is told to Alexandra and Bobby, both by others, in anecdotes often second- or third-hand, (usually translated by Bobby) and by Stoyan’s own account, written as a confession, that details the important milestones in his life from 1940 onwards. Kostova gives the reader a tale that has it all: mystery, romance, history, politics and corruption, a secret compartment, labour camps, violins and a faithful, heroic dog. All this rendered is gorgeous descriptive prose. The protagonist’s quest takes the reader on a tour of Bulgaria while subtly informing about a shocking history not commonly known. Kostova’s original plot has several twists that even the most astute reader is unlikely to anticipate. Tension-filled pages build up to a very exciting climax, and several of the multi-faceted characters are not what they at first seem to be. Kostova’s extensive research and her familiarity with Bulgaria, her politics, her history and her customs, are apparent on every page, as is her love for the Bulgarian people and the landscape: “On every horizon Alexandra saw mountains, some of which were blue and very distant, beyond a great plain. Others were closer and rubbed with darkness, like long smudges of soot”. This inspirational story demonstrates what one will do to endure. The Shadow Land is intriguing and informative, but also moving and very uplifting. A superlative read. Most reviewers pretty much start out their review of Elizabeth Kostova’s newest book, The Shadow Land, by stating how much they loved her debut novel, The Historian. A beautifully written and suspenseful work of fiction, The Historian told the story of a girl’s search for the historical vampire-like person that inspired Stoker’s Dracula. Kostova gave us a history lesson, a tutorial on Eastern Europe, and a great story and it was well received. 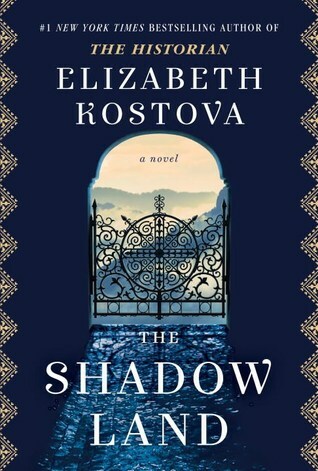 Her latest, The Shadow Land, also takes place in Eas Most reviewers pretty much start out their review of Elizabeth Kostova’s newest book, The Shadow Land, by stating how much they loved her debut novel, The Historian. A beautifully written and suspenseful work of fiction, The Historian told the story of a girl’s search for the historical vampire-like person that inspired Stoker’s Dracula. Kostova gave us a history lesson, a tutorial on Eastern Europe, and a great story and it was well received. Her latest, The Shadow Land, also takes place in Eastern Europe, Bulgaria to be exact, and I am seeing some not so enthusiastic early reviews on the internet. The book jacket synopsis promises a story of suspense and danger, words that bring to mind a completely different type of narrative for some readers. I was taken in by this promise and so found myself initially annoyed at the complete lack of suspense and minimal danger and almost did not finish the book because I felt mislead. Then I looked at it from another angle: this book is not about a woman in danger, this is about a woman taking a journey and discovering herself and coming to grips with guilty feelings from her past. This is a story about the terror and tragedy of Communist Bulgaria. It is about suffering and loss and family. While the main character, Alexandra, travels across Bulgaria in her quest to return an urn containing the ashes of a deceased musician to his family, she learns his life story. Each city, each stop she and the taxi driver, Bobby, make in their search for the urn’s owners is another chapter in the poignant life of Stoyan, the musician. She grows close to members of his family, she makes a fast friend in Bobby and, despite its tragic political history, she falls in love with Bulgaria. With each stop or backtrack or new character voice, I found myself wondering, “where’s the action, the suspense, the drama?” There are a few scenes with Alexandra and Bobby that adds tension, especially when Bobby’s past comes into question, and they find an empty house that’s been ransacked with some of the family members missing, but that’s not the impetus of the story. A relationship between the deceased musician, old Communist forced labor camps, and the present day politics of Bulgaria—the chapters about the camps are painful and heartbreaking—is a major factor, but that connection is not THE story. Stoyan's life, while probably the strongest component of the book, is not the whole story. Alexandra’s loss of her older teenage brother is a significant part but, again, this is not the story. I do understand the readers who didn’t like the sudden flashbacks or narrative changes. And I did find the coincidences too coincidental. And the mystery? Completely solved within a few chapters (I completely missed how Alexandra was saved at the end because I had accidently skipped a sentence). Some did not like the main character; she wasn’t flashy or a standout. And some found that Stoyan’s diary interrupted too much—I actually found it the most interesting part. Some even found the last chapter an odd and unforeseen conclusion to the story but I recognized it had been building up to this part of Alexandra’s life. Her Elizabeth Z. Johnson Kostova was born Elizabeth Z. Johnson in New London, Connecticut and raised in Knoxville, Tennessee where she graduated from the Webb School of Knoxville. She received her undergraduate degree from Yale University and a Master of Fine Arts from the University of Michigan, where she won the 2003 Hopwood Award for her Novel-in-Progress. She is married to a Bulgarian scholar.